Zachariae Ice Stream June 17 2013 note all the late 2012 icebergs yellow dots, terminus position which has retreated since July 2012 and the rift that promises to release more icebergs as soon as the ice has cleared. The quality of the image, is due to the fact it is a swath image. From what I saw on r03c03 tonight, I'd say the Zachariae is losing some big calvings. Can you get a similar image on '13? Where do you this calving *)? And what do mean with on 13? *) Are you thinking about the break up of fast ice outside Zachariae? Lots of calving off the front of ZIS as the large rift noted early this summer has peeled off as of July 23. The shattering and rapid eastward flow of the chunks of ice along the north coast towards the head of the Fram has been spectacular in the last few days. Yes it is a very interesting part of the Arctic, at least IMHO! Is 79 or Nioghalvfjerdsfjorden on the move a certain crack pattern in front of the glacier may indicate so? Have a look. Please click on the image to enlarge ! We all know about the famous Petermann and what headlines she is creating when calving, but compared to Zacharia Glacier she a minor in that discipline, estimated loss of Glacier surface / area at Zachariae is somewhere in the region of +/- 1,850 km2 between 1976 and 2013, where as Petermann "only" calved some +/- 400 km2. Petermann may win the sideline competition when it comes to volume? Please click on image to enlarge and for much better details! How long can that aborted tongue last with warmer waters able to attack from both sides? Probably quite a few years depending of the thickness?! *) As reported by Yuha, one of our movement spotters, see above! Please click on image to enlarge and for better details! Notice on the image above from Jøkelbugt 2003, the Delta Area (click on the image to enlarge) is not that developed, and Spaltegletscher north of 79 is reaching much further north, than today. More action from Zachariae, the glacier retreated substantially since 2012, I will make an animation later. Notice how little is left of the fast ice of the coast compared to 2102. I may be the first year in about 10 years Belgica Bank will be without it. Please click on image to start animation and enlargement. Spaltegletscher part of Nioghalvfjerdsfjorden ( 79 ) Gletscher could soon calve a major part of what is left of that gletscher, a large crack is observed across the glacier (+/- 6 km) and there is only 1.7 km to go before it reach an opposite crack. 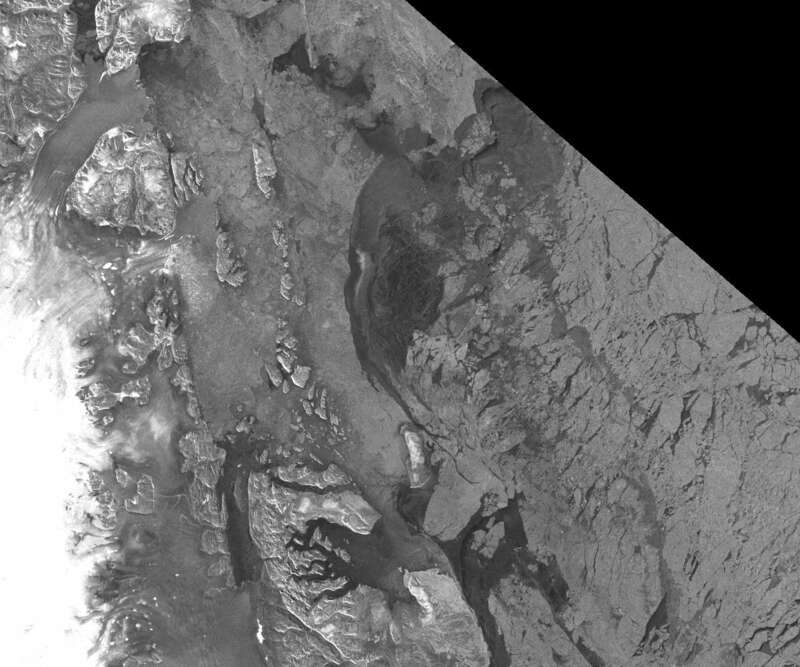 The images below show the glacier and below that a close up of the crack. Please on image to start animation and enlargement. Interesting action is seen at Zachariae Glacier, the ice in front of the new established calving front is now being cleared, this has not been seen since satellite image were available, this is where the Red Arrow is located. Further south at Sanddal (Sand Valley) a heavy flow of silt (sandy alluvium) is clearly seen (Green Arrow). Opposite most other places in the arctic, big changes are seen in this area. Would this heavy flow of silt be evidence of a large volume of basal melt water flowing out from under the land ice? 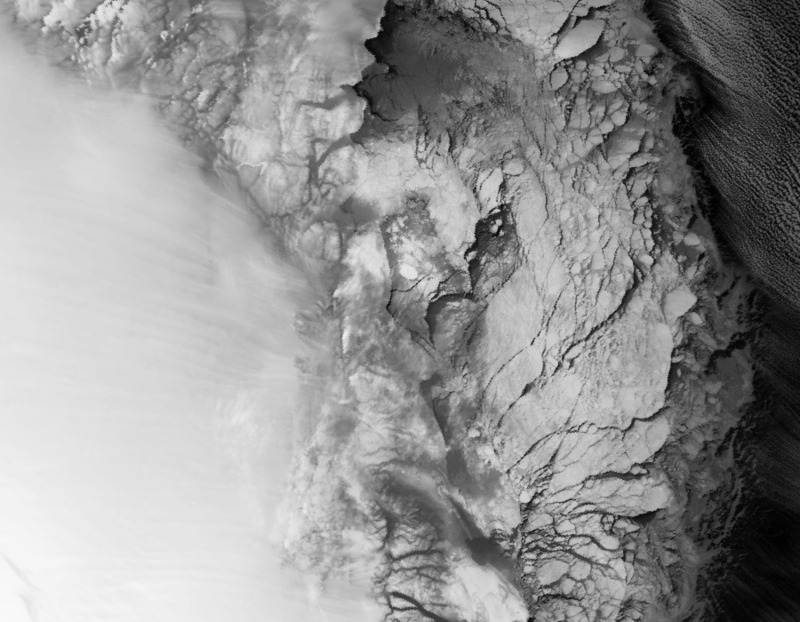 What has the melt season looked like in this region of Greenland? If someone asked me, whats up in Grenland? My answer would definitely be Zachariae Isstrøm / Glacier. For the first time in satellite and recent history there will be open sea in front of this glacier, last year the main glacier was separated from its original tongue to the ocean. Why did this happen? My answer would be, I know some will disagree, it is due to lack of surface flow from GIS in this area, none of the glaciers in this relative large area from L. Ibstrup Bræ / Storstrømmen in the south to Kofoed-Hansen, Blæsebræ, Gammel Hellerup Gletscher, Zachariae Isstrøm, Nioghalvfjerdfjorden and Spaltegletscher in the north are showing signs of movements seen from above (landsat), all actions, in my opinion is coming from below, but what is the reason for this? In the image below I want you to study the area marked with GREEN until the real sea freeze begins, later this month. Actually raised more than you answered but I think my questions should be on the "Stupid Questions" thread. Although the melting seems to be over, action is still taking place in the Arctic Area, at Zachariae Glacier, a new bay " Zachariae Bay" is born in front of the Glacier, as you can see from this animation from September 5 to 16, the debris and ice (Sep 5) from the glacier is now flushed out, that can be seen under the light clouds on the September 16 image. Another Landsat animation showing the action between Aug. 21 2013 and Sept. 9 2013. Is the tongue disintegrating right before our eyes? Exiting stuff is happening right now, "Zachariae Bay" in front of Zachariae Isstrøm is cleared from ice and other "hard" water debris, this never happened before in modern history, at least not in the satellite age and probably much longer back. It will be interesting to see if this retreat action will accelerate as I suspect or it will result in a surge which I doubt. I also expect the X-Zachariae Tongue to get beaten up from both sides in the next few seasons. You thought it was over? No Wipneus came up with some really amazing stuff, now we can retrieve images from Landsat you didn't know existed , and they look like you clicked them from a low flying Cesna, I my self believe these images are game changer when it comes to observe glaciers, GIS etc. Look at the details they are just out this world. Thanks again to Wipneus for this new tool. Click on image to enlarge, please do it is worth it!!! Notice the huge difference between 2000 and 2013, 1600 km2 of Glacier ice disappeared or almost 20 times the size of Manhattan or 8 times what Jakobshavn (the big star) lost and almost 3 times as much as the other darling Petermann lost in the same period. But Zachariae did that with almost no notice. Some experts even say it is business as usual? 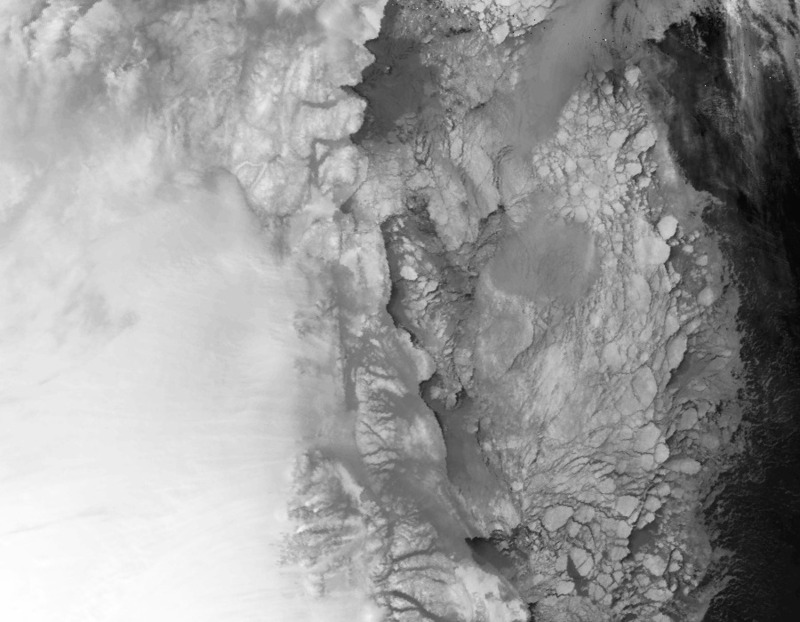 These images are great, I think I can see the edge of the ice shelf and the icebergs illuminated by the low sun giving an indication of freebord, or is that an artifact of imageprocessing? Also interesting is the small ice cap seen, in the light of the Miller at al paper discussed elsewhere on the forum. Could you comment on what can be seen on more recent IR images, which of course have much lower resolution, but might give an idea how things are changed by less landfast ice. There are plenty of cracks in the ice which is forming in the cold darkness. I have to admit I don't understand what sensor was used and how to interpret this image, but it looks a lot clearer than AVHRR. Can anybody explain? NE Greenland has been hotter than most of the rest of the island. 1. Am I misreading that map? 2. If not, isn't it both very odd, and potentially very closely related to the events described above in this thread? LandSat is an optical/thermal sensor system with a resolution of 15-m at best. visible, near infrared and shortwave infrared sensors comprising 13 spectral bands: 4 bands at 10 m, 6 bands at 20 m and 3 bands at 60 m spatial resolution , with a swath width of 290 km. Further firn / glacier retreat. As can be watched on the animation below, climate and weather changes are not taken its toll only in the sea around Zachariae Isstrøm and Kap Zachariae / Lambert Land *). A little north of Kap Zachariae a firn (glacier) is found in Misanthropen Fjelde **), the area of this firn has been reduced considerably since 2000, the same happened to several other firns in the area surrounding Zachariae Isstrøm. *) The name Land van Lambert is found on charts from 1718, and named after ? Lambert, a Dutch whale hunter. Please click on the image to start animation and enlargement!